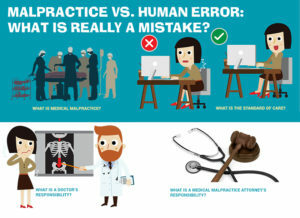 Malpractice vs. Human Error: What is REALLY a Mistake? Regardless of the quality of education and training received by a doctor, mistakes can and do happen. If you believe that you have been injured as a result of a medical procedure or treatment, you should be able to determine whether your case crosses the line from human error into medical malpractice. If you are a victim of medical malpractice, you may be able to receive compensation for your injuries by filing a medical malpractice lawsuit. Click here for more information. But first you need to know, what exactly is medical malpractice? And what do you need to prove your case? 1. So, what is Medical Malpractice? There are several elements that must be in place if you intend to file a compelling medical malpractice claim. When a physician acts recklessly or negligently towards a patient, and this situation causes harm to that patient, then the patient may suffer damages or injuries and become entitled to file a medical malpractice claim. An error on its own, though, does not necessarily constitute medical malpractice. 2. What is the Standard of Care? If the mistake would not be expected from a reasonable and careful physician administering the same diagnosis or treatment, and you have suffered serious injuries as a result your care, then your case may be more than just a matter of simple human error. There is a certain standard of care that needs to be observed by doctors, and if you can prove your doctor or health care provider acted in a way that was less than that acceptable standard, you may be looking at a potential medical malpractice issue. 3. What is a Doctor’s Responsibility? However, bear in mind that it is not the responsibility of your doctor to guarantee a specific outcome or cure. Rather, the important thing to remember is that the provider is responsible for giving you medical care in line with the standards accepted throughout the medical community. 4. What is a Medical Malpractice Attorney’s Responsibility? One of the most important things you can do if you believe you have been injured by a doctor’s lack of care or inaccurate/delayed diagnosis is to discuss your case with a medical malpractice attorney. Having your case evaluated by an experienced attorney can give you better insight into whether it’s the right to move forward with a claim. 5. Knowing is Half the Battle…and the Most Important Thing You Can Do. While your Boca Raton medical malpractice attorney cannot guarantee success or a particular outcome, it can be an important opportunity to understand the real potential of your claim. If successful, your medical malpractice attorney can help you chart a course for the future so that you can focus on recovery. All in all, the laws surrounding medical malpractice in the state of Florida have changed considerably over time as many citizens have attempted to commit fraud or make other types of fraudulent claims against medical practitioners in hopes of obtaining a large settlement. It’s important to familiarize yourself with the laws and statutes of limitations surrounding potential medical malpractice claims. For help with the process, speak with a reputable Boca Raton medical malpractice attorney. While no patient should have to suffer through a doctor’s mistake, not every case may qualify as a medical malpractice claim. Having your questions answered by an experienced Boca Raton medical malpractice attorney and learning more about your options can help you determine the most appropriate thing for you to do. Schedule an appointment with a Boca Raton medical malpractice attorney sooner rather than later so that you can get your questions answered.